Andrew’s got a stack of manuscripts! His experience formatting for ebook and physical books. Preparing your work so that others can best read it. Magic Leap is making moves. What does a successful AR/VR device look like? An analysis of the BTTF trilogy. Goblin-mania continues! Andrew enlists his Twitter followers to crowdsource a title for his new book. Advice on coming up with titles and covers. Communicating with designers. A goblin update! Something screwy on Mars. SpaceX will try the Falcon 9 again. 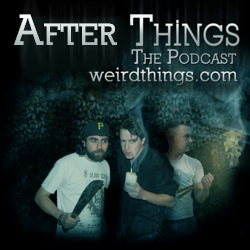 Bryce joins Brian and Justin for a new Weird Things! A big breakthrough in mealworms. How do we scam money out of indigenous peoples? The hard, hard choice to edit. The hard, hard process of shooting a film with your friends Ways of handing out critique. How should you request feedback? Flowing water on Mars. Can we expect life? The Martian discussion (spoilers, 21:17-43:06). A trio of Martian mysteries. You are currently browsing the Weird Things blog archives for October, 2015.